Description: This three-story, triple roundhouse tower apartment complex is designed to provide affordable housing in urban areas. The towers are primarily earthen construction. Made with earthbag tubes filled with earth and tamped solid, very few manufactured/processed materials are required. This greatly reduces construction costs. The apartment name comes from the fact rainwater is captured on the roof and directed to underground cisterns, which reduces demand on city water supplies. Each apartment is accessible by a spiral staircase in the front tower. Features include spacious 201 sq. ft. bedroom with large closet, modern kitchen and comfortable living room. All rooms are round to create an embracing, inviting ambience. The round towers are naturally stable and form a visually striking exterior. 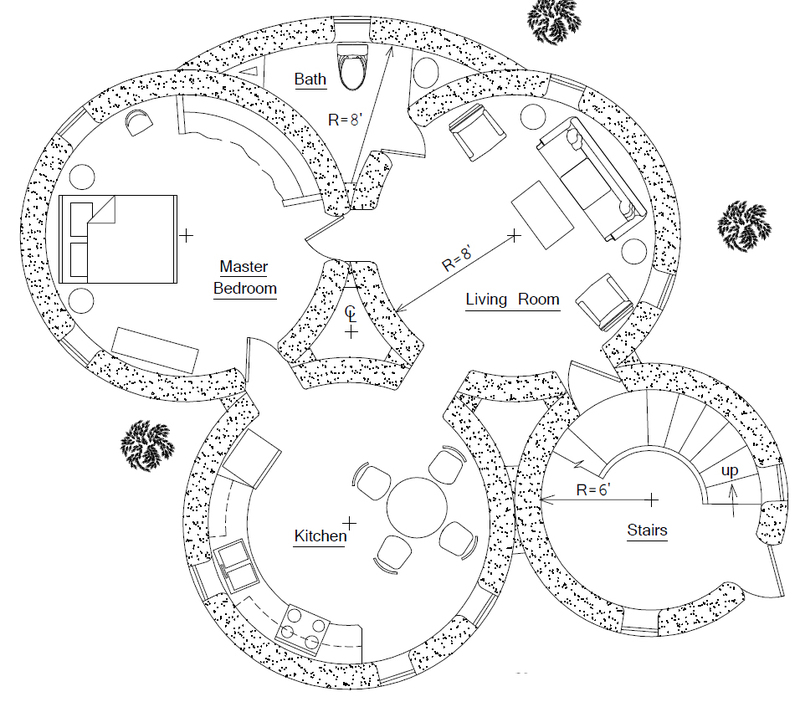 Have you considered a Larger complex style design to take in with consideration for space? It seems to me that such a design could be a probable answer to homelessness in rural USA. I can’t exactly say urban USA specifically because of alot of variables I can’t account for. Primarily space. But with this design I do think with specific social engineering can be used to make sustainable communities for the homeless. Right, this design or similar ones could be used in rural areas. 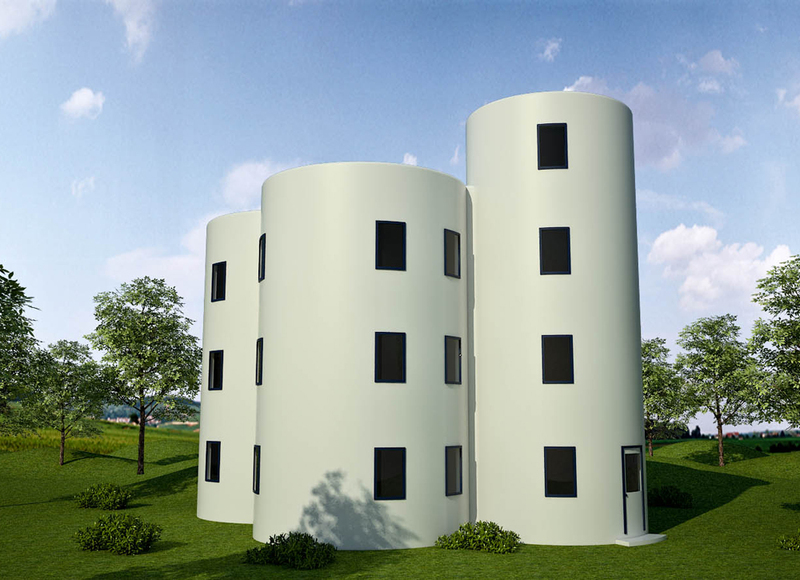 I have another Rainwater Towers design for larger families (bedrooms) coming out in 1-2 days. Does the does the increase in height substantially increase the cost per square feet substantially? Depends on the building process. You want to mechanize the process with a lift of some sort. (Search our Earthbag Building blog and EarthbagBuilding.com website for keywords such as machines, mechanize, production building, etc.) And good to have lots of low cost labor (common in areas where these are likely to be built). So this is similar to the question “how much do the materials cost?” You have to figure out your building system and make a cost estimate for labor, machine rental, etc. After looking at lots of plans for earthbag homes, this is the one sis likes best so far. How/where are blueprints available? I really would like to buy the blueprints for the tower earthbag house . One thing I would like to say I have never heard of sand bag or earth bag homes my life and I thing it is the most eye openen idea in the world just thoulght I would say that . There’s now hundreds of pages of free information. Owen, what’s the highest vertical-wall structure ever attempted in earthbags? This is the tallest I’ve run across. I’m curious what the limitations are, both in theory and in terms of what’s been tried. Let me know. Research earth building in Africa and you’ll see the very tall structures that have been built. I believe they’re primarily cob. Earthbag is stronger than cob, especially if you use the reinforcing methods we recommend and discuss on our Earthbag Building Blog and website at EarthbagBuilding.com. codes are a big factor. Building codes in most areas would not allow very tall earth structures without special design that’s been approved by an engineer (addition rebar reinforcing, cement stabilized soil, reinforced concrete foundation, etc.). You can build trailer houses that fall apart in 10-20 years and offgas poisonous gases, but it would be almost impossible to build earthen structures like those in Africa that have lasted hundreds of years unless you live where there are minimal building codes. I’m daydreaming about creating university student housing using this design. Make the roof into a common patio. What a cool dorm that would be, huh? What would the hurricane resistance be on a structure like this or the other version? It would hypothetically be in a South Florida location, so humidity would have to be taken into account as well. For hurricane areas, it’s best to build one story structures like roundhouses that wind will blow around easily. You want a strong roof to resist uplift and to protect the walls. You want plenty of windows for ventilation and sturdy shutters that can be closed during storms. Where can plans for this design be bought? http://dreamgreenhomes.com/materials/earth/earthbags.htm Not all plans are shown so just leave a comment on the order form and I’ll make sure you get the right plans. Email Kelly about ordering questions.